A notorious bandit has been shot dead by police in India after evading them for more than 30 years, police say. The bandit, Shiv Kumar Patel, who was also known as Dadua, was killed along with several members of his gang. Dadua was wanted in connection with more than 200 criminal cases, including murder, extortion and kidnapping. He and his gang operated for decades in ravines and forests on the borders between the Indian states of Uttar Pradesh and Madhya Pradesh. Separately, six policemen were killed in a clash with a gang led by another notorious dacoit (bandit), Thokia, in Uttar Pradesh on Sunday night. Correspondents say that Dadua was hailed by many as a modern-day Robin Hood. "After a fierce battle, in which [the bandits] also used sophisticated weapons, the police were able to kill Dadua. 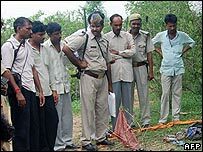 He has been identified by the villagers," inspector general of police AK Jain told the Associated Press news agency. Mr Jain said that four of his accomplices had also been killed in the battle in the Chitrakoot region, some 300km (185 miles) south-west of Uttar Pradesh state capital, Lucknow. A home ministry official told the AFP news agency that the bandits had been located following a tip-off. According to AFP, locals identified the badly-disfigured body as that of Dadua although officials say they are to have DNA tests conducted on it before handing it to relatives. Locals said he managed to avoid being caught for so long because he was supported by villagers who often took a share of his spoils. "His words were diktat in ravines and people used to vote for candidates supported by Dadua and therefore political parties preferred not to rub Dadua on the wrong side," local aid group leader Ramesh Sharma told AP. But Dadua appears to have backed the wrong party in recent state elections. "The changed political equation brought the end of this dreaded bandit," Mr Sharma said. Correspondents say that bandits from another gang ambushed the police as they returned from the operation in Chitrakoot. "Two dacoits were killed. We also lost six of our men," the home ministry told AFP. The Chief Minister of Uttar Pradesh, Mayawati Kumari, said the 22-member police team involved in the battle would be given a collective reward of 1m rupees ($25,000). In October 2004, police shot and killed the man known as India's most notorious bandit, Veerappan, in the forests of southern India.